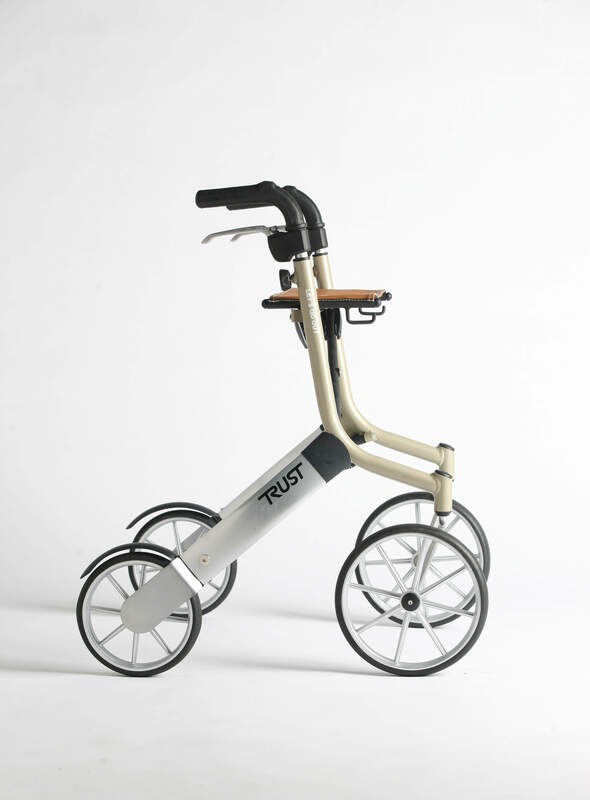 A highly manoeuvrable rollator with a beautiful modern design. Price excluding VAT.(Incl. VAT £289) *VAT Relief available on this product. The Let’s Go Out Rollator has a beautifully modern and stylish design that will help you move around your home, garden, or get to the shops safely. 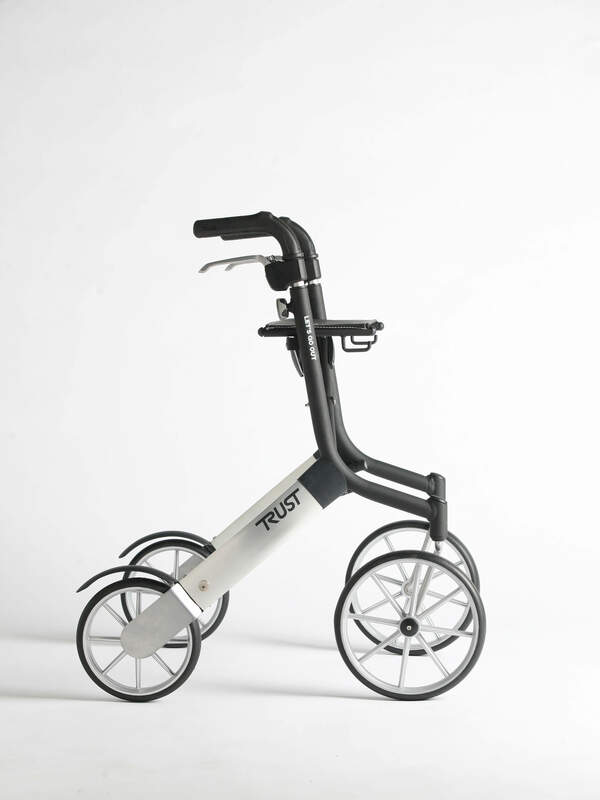 This lightweight rollator can be folded down to 20 cms, stored inside a car boot, or safely away in a small place. There is a lock on the seat to ensure that the rollator stays unfolded. When you want to fold it, simply lift from the middle of the seat which will release the lock. The soft feel ergonomic handles provide excellent comfort and stability when walking along. They can be adjusted to a height that suits you between 77 – 95 cm. The responsive brakes can be used to maintain a suitable speed when walking down a hill and they can also be locked when parking the rollator. 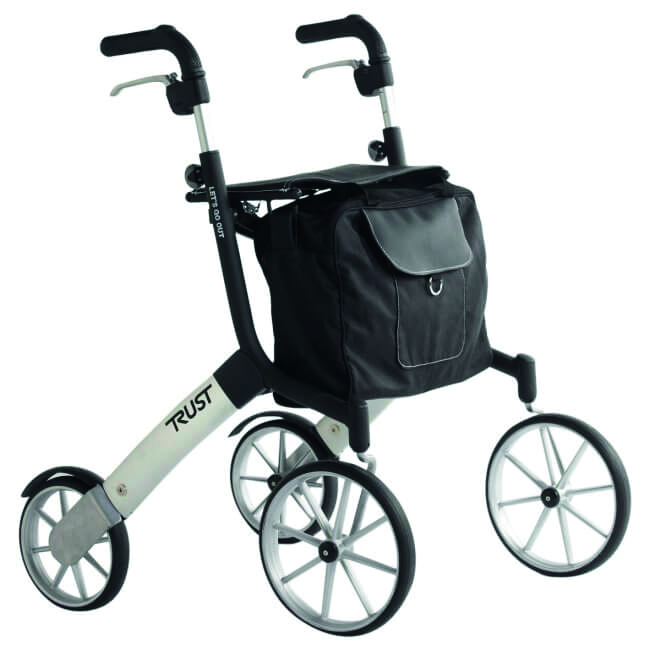 So you can enjoy your journey, big wheels have been fitted to the front and rear of the rollator. These make it simple and easy to navigate kerbs and other obstacles you might come across. The Let’s Go Out is the first rollator that has built-in soft suspension on the rear wheels which helps to absorb bumps and provide a smoother walk on rough surfaces. To keep your clothing from getting dirty in those wet or muddy conditions, there are mudguards on the rear wheels. The artificial leather seat is comfortable, water resistant, and acts as a great place to sit or rest. A handy bag which sits neatly under the seat can be used to store your personal items or shopping. Available in either beige/black or black/silver.